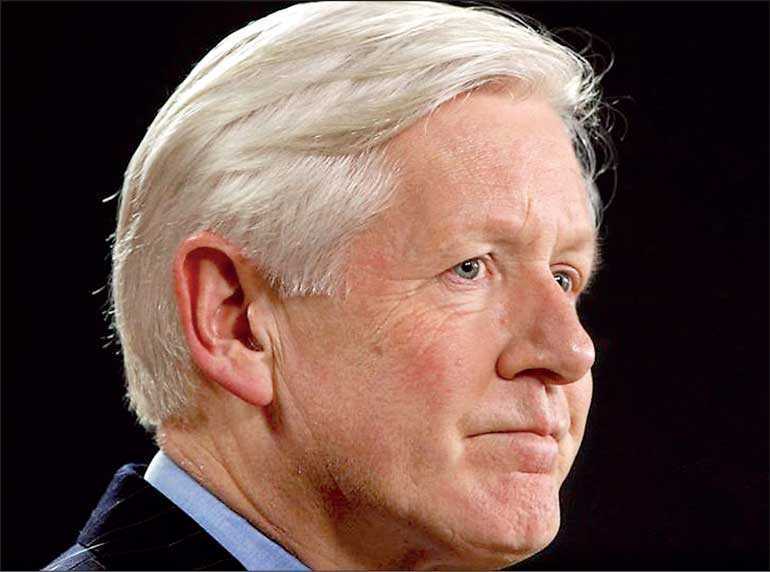 Bob Rae is a former Member of Parliament, former Interim Leader of the Liberal Party of Canada, and former Premier of Ontario. Rae was the Chairman of the Forum of Federations. As Chairman, Rae helped oversee constitutional discussions between the Government of Sri Lanka and Tamil Tiger rebels. In his critically-acclaimed book, Exporting Democracy: The Risks and Rewards of Pursuing a Good Idea,’ Rae dedicates a whole chapter to the ethnic conflict in Sri Lanka and his experiences overseeing negotiations between the senior individuals of the LTTE and the Sri Lankan Government. In 2015, I had a chance to sit down with Rae for an interview to discuss his role during the Norway brokered ceasefire between the Sri Lankan Government and the LTTE. Rae stressed the need for Sri Lankan to adopt a pluralist constitution that respects, protects, and provides rights to all communities. Given that 27 November—widely known as Maaveerar Naal among Sri Lankan Tamils—just recently passed, it is worth looking back at history and seeing why the conflict ended in such a brutal and violent manner and why a peaceful solution to the civil war did not occur. Q: Can you tell me how the Forum of Federations initially became involved in Sri Lanka? We were approached—initially before and after the ceasefire was negotiated—by the Government of Sri Lanka and by the Government of Norway to try to help in the process of discussions with the LTTE. You’ll remember that there was a major attack at the airport in Colombo in 2001, and at that point I think there was a sense inside the Sri Lankan Government that it was time to try to engage with the LTTE to see if there was a possibility of finding a negotiated solution. 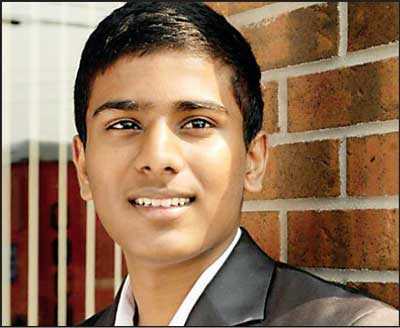 So, for a period of about three or four years, the Forum of Federations, and I, as Chairman, as well as David Cameron (the Dean of Arts and Science at the University of Toronto), were working closely with the [Sri Lankan] Government, with the Government of Norway, and with the leadership of the LTTE. Q: Why didn’t anything substantive and meaningful come about from the negotiations you had with the senior leadership of the LTTE and senior members of the Sri Lankan Government? Well, as I outlined in the book, there are a lot of reasons. I think fundamentally the reason that a negotiation usually fails is because either one party or both parties to the negotiation conclude that it is better to continue with the struggle and the conflict than to try to reach a solution. And in the case of the Government and the Tamil Tigers, the conclusion that I came to [was] that the gap between them was just too big—that the level of ill feeling was too strong. On the one side, I think the Tamil Tigers’ memory of discrimination and of hardship went back a long way in terms of the conflict in Sri Lanka and in the case of the Government, I think the sense was well, the price that’s being asked is too high. It threatens the unity of the island and they felt increasingly confident that they could win a military victory. Q: Did you ever personally believe that the LTTE was genuine in coming to a peaceful agreement or did you think they were just buying time for the next military confrontation? No, I don’t think they were disingenuous. I think both sides would have liked, if possible, to find a solution, but the reality is that what the LTTE would have required would have been a major change in the governance of the country and what the Government was prepared to do was nowhere near that. So I think in a sense both sides had other agendas and other possibilities of returning to conflict in the back of their minds. And I think that’s revealed by the number of times that the cease fire was breached. I mean the cease fire was a very imperfect instrument. There was an end to a lot of overt conflict, but there was still a lot of skirmishing going on and a lot of breaches of the agreement. Q: The Forum of Federations, they always tried to push a federalist solution, but the LTTE just wouldn’t buy it. Well, I’m not sure I’d say that we were pushing it. I think what we did was—[during a meeting] between [Anton] Balasingham and the Government in Oslo in 2003-2004, I’m going by memory with my dates, where it looked as if they were agreeing that a range of possibilities within the federal arrangement should be looked at and should be a focus. That’s really what the subsequent conferences were supposed to be about in terms of looking at what that would mean, but you know the word federalism, and I used to call it the “F” word because the Government hated it, the federalist word, and I think the leadership of the Tamil Tigers never really believed, that the Government of Sri Lanka would give them enough autonomy and enough capacity to run their own province or their own state. And therefore they were sceptical about whether it would really provide some answers. Q: During the negotiations, you had access and ability to travel throughout the Wanni region. Did you get a chance to talk to civilians, and if so, what was their general impression of the LTTE’s actions? Did they support Prabhakaran and his idea for a separatist state or did they want federalism? Well, let me tell you, I mean it’s very difficult because the Tamil Tigers still had a very dominant role in the Wanni so you could have informal conversations with people, but people were very afraid to speak openly. It was essentially a militant leadership that was very tightly controlled and very disciplined in their approach to conversation and dialogue. Cameron and I got to know them quite well, but I wouldn’t say that we explored fully all the range of things that they might be prepared to think about. My sense was that I never met with Prabhakaran and the fact that I never met with him made me believe that he was never really engaged in that process. He always believed there was only going to be a military solution. And my problem with that approach was, and I’ve said this to the other leaders, was that if it went back to a full-blown conflict, that the LTTE would lose and would be defeated and it would be brutal. And unfortunately, I was right. I’m not happy that I was right, but I certainly felt that the world would not come to the attention of, to the aid of the Tigers. And then particularly after 9/11, the game was up. This was not something that was going to be countenanced by Sri Lanka’s neighbours and it was not something that was going to be supported by the Americans or the Brits or anybody else. Q: In your book ‘Exporting Democracy,’ you talk about certain mistakes that Prabhakaran made like he didn’t accept the Indo-Lanka Accord, the Rajiv Gandhi assassination, so what do you think are the biggest mistakes Prabhakaran made that led to his defeat? I don’t think you can say that Prabhakaran alone is responsible for what happened. I think that what I’m trying to say in my book is that you have to understand that there were hard liners on all sides. I mean there are within Sri Lankan society, there are those in the Sinhala community who don’t believe that there should be any particular recognition of the reality of a different Tamil culture and the need to recognise the diversity of Sri Lanka. There’s a real question as to how much diversity and how much difference and how much pluralism the elements in Sinhala society are prepared to accept and that’s always been a challenge. Plus there were those who said let’s just carry out a military solution and let’s just impose our will, we can get away with it. And I always felt that if that were to happen, it would happen at a considerable price and I think Sri Lanka has paid a high price for having essentially found a temporary resolution ‘cause there’s no deep-seeded resolution of the conflict. There’s just a kind of a repression of the conflict. And I think that’s the issue that everybody has to look at. But within the LTTE, I think Prabhakaran had too much control over everything. I think that he did not allow for an open discussion with a whole bunch of people about what might or might not take place, and he was unable to, in fact, to transition from a militant essentially guerrilla army with a very narrow left wing nationalist agenda to a more broader, again, more pluralist, I use that word, view about how coexistence within a single country was the only practical solution. And, I think that the strategic mistake was to understand that in order for any solution to be found, significant allowances have to be made, particularly for what the Indian Government would allow or what they would see as a reasonable position. You can't just pretend that Sri Lanka isn't next to a nation [India] of a billion people with a very large Tamil population that has created a federal structure and that believes there is ways these things can be resolved. And I think that Prabhakaran took a series of steps rejecting the underlying core. I think it’s clear organising the assassination of Rajiv Gandhi, which was a terrible, terrible tragedy. But it was also a terrible mistake. It was just like, you can't do that, and expect to get away with it and expect other governments to say, well, that's in the past. I mean, it was very clear to me in all of my discussions with Indian officials that, that was something that was not going to be forgotten. And I think it was clear that's what happened. I'm not a guerrilla, okay. I'm not somebody who believes that power should come out of the barrel of a gun. I don't think that's the way to lead a country. I go into the stores in Scarborough in Toronto and I see pictures on the wall of Prabhakaran. And so, I'm aware of how he is been lionised and remains a revered figure in many, many parts of Canada as in many parts of Australia, many parts of England and many parts of Sri Lanka. I'm still entitled to my own view, which is that he maintained a single-handed and ruthless control over his organisation. And did not allow for the transition to a more peaceful and democratic approach. And if you take the example of the PLO, all the criticisms that one can make of the PLO, I've certainly made them over time. They have begun this process of transition. I mean, that's why there's a big debate going on as to how we move forward. And that's why President Abbas is criticised because he wants there to be a negotiation with the state of Israel. They are recognising increasingly the need for a democratic solution. I never found that kind of language coming out of Prabhakaran, any written statement that he made or any speeches that he gave. I never saw that as part of his vision. Q: In your book, ‘Exporting Democracy,’ you asserted that a reason why the negotiations weren’t successful is because of the two main political parties in the south. They were at each other’s throats. And now that the LTTE is defeated, do you believe federalism is a more viable solution? a result of recognition on the part of all sides that some kind of pluralist constitution is the only answer. Pluralist in the sense that, centrally the institutions have to reflect the diversity of the country and that geographically, the states and provinces, whatever you want to call them, have a unique relationship with their own people. And, I don't think the political will to get to that kind of a resolution was present in Sri Lanka. I mean, I had hoped that it would be. We agreed that we would facilitate discussions to see what could emerge from the give and take. But in the end, I think we had to come to terms with the fact that it simply wasn't going to happen. Now, the question is, well, the underlying facts of the country still speak to the need for a more diverse constitution and for a greater recognition of minority rights. And this goes back to the beginning of the real sort of modern political debate in Sri Lanka, which came I guess with the arrival of the British and then the departure of the British. And, so far the majority has not been able to pull it off. They have not been able to find the political will within them to resolve the issue. And there are a lot of elements within Sinhala society which don't respond well to that. Q: If you had it your way, looking at it from your perspective, what would be the ideal federalist solution? Well, I think, first of all, I mean you as a young social scientist, you will appreciate this. You have to look at the evidence, you have to look at the facts, and there hasn't been a modern-day census in Sri Lanka for a long time. We need to look in an objective way, we need to look at where people are living and how people, where exactly people are and what the relative makeup of the population is. 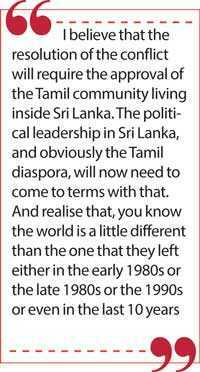 I suspect what we would find is that there is still a Tamil majority in some parts of the country, but that there's also been a significant movement of the Tamil population to Colombo. We would need to find ways to allow for a greater degree of provincial autonomy, as well, which would imply that in the case of some provinces the Tamils would have a majority in that province, but there would have to be protections for minorities everywhere. And there would have to be protection for both communities in the reform of central institution. So, that you don't have a non-representation of the Tamil community on the courts in the upper house in the political structures. And that their interests are protected at the centre as well as their interest being protected in the provinces. But if you look around the world, I mean, you know, this is in a sense the strength of the federalist's idea is that around the world there are a number of different ways of doing this. There's not just one way, it is not like you take a cookie cutter off the shelf and say, here it is, here's your constitution. People have to come to it in their own terms and in their own ways. And that I think still a discussion that needs to happen. Q: A lot of people are quick to call what happened to the Tamils in Sri Lanka genocide. Even, your former Liberal colleague MP Jim Karygiannis, whom I interviewed, said that what happened to Tamils in Sri Lanka is ‘nothing less than genocide’. I'll say, no, to me it's… let's call it, for what it is. It was a horrendous, violent attempt to overpower the Tamil minority and to entirely eliminate the political leadership of the community. Now I have problems with some of the elements of the political leadership. I had disagreements with the LTTE and I still get criticised in the Tamil community in Toronto for being not sufficiently supportive of the LTTE. I'm not a fan of the LTTE. I don't think what they did had a positive solution at hand and it was kind of a cult. And I talk about that in the chapter and say, you have to look at it in a more tough-minded way and say it doesn't meet the test of a modern, open political movement. Q: Organisations like the Transnational Government of Tamil Eelam (TGTE), when you criticise the LTTE, they demonise you. The TGTE is quick to criticise the Government’s actions, but they do not mention how the LTTE used civilians as human shields, forcibly recruited children into armed combat, and their atrocities against Muslims, etc. Well, I mean, as they say, they are what they are. The fact is that this happens often where in international conflict, the diaspora groups that have maintained a position, which I think if you looked at it objectively, you would say, well, that's actually a different position than the one that's being adopted by many inside Sri Lanka. And so that is something that we have to contend with and we have to deal with. But essentially I believe that the resolution of the conflict will require the approval of the Tamil community living inside Sri Lanka. The political leadership in Sri Lanka, and obviously the Tamil diaspora, will now need to come to terms with that. And realise that, you know the world is a little different than the one that they left either in the early 1980s or the late 1980s or the 1990s or even in the last 10 years. Q: Do you support the Tamil groups, the TGTE’s call for Sri Lanka to be referred to the ICC to face charges of war crimes? I do think that it is inevitable that there will be a reckoning for what took place because I don't think we should underestimate the extent of violence against the Tamil minority. I also think that if you were, I suspect that if you were to do a truly objective analysis, which the court would have to do, it would relate to crimes both by those who were in Government and in power as well as by the leadership of the LTTE. There is enough responsibility to go around here. And I think everybody has to face up to that, that some of the things that were done and not just done, you know, in terms of the fight between the LTTE and the Government. But even within the Tamil community itself, you have to... one has to recognise that terrible things were done by the LTTE towards people who had a different perspective and different point of view. I mean, I feel very personally much caught up in this because I have [Tamil] friends who [spoke out against] the LTTE and were killed. I have made friends in the LTTE leadership who were also killed, and, you know, you can't come away from that without a sense of just a deep, deep anger and sadness at the fact that people chose violence as a way to resolve the conflict. [As] somebody who's been in Canadian public life, I'm used to being criticised. So, I don't take that as a final judgment. I still believe that whatever name you give, a pluralist constitution is one which recognises the diversity of the population and the integrity of human rights, whether it's for Canada or whether it's for Sri Lanka. It's the right way to go because in the absence of pluralism, you have repression, and if the distinctiveness of different populations [are not] recognised, you have repression. Repression is never the answer. What we have to continue to do is, work hard, very hard at really trying to find more creative solutions. I think the one thing that is true is that, as I said before, there is no cookie cutter where somebody from the outside said, well, here's your constitution. That's not going to work. It's got to come from inside. Q: Rae, you have been a staunch defender of human rights throughout your entire career. What do you want your legacy to be or what do you want to be remembered for? Well, I don't want to be remembered for anything because I'm not dead yet. And, I have no intention of stopping my engagement. I mean, I still look forward to new engagements. I'm working hard on aboriginal issues in Canada, which I think are some very critical human rights issues. Like the question of indigenous rights in our own country and around the world is a very critical question—and an exciting one that we have to continue to understand and work on. But I think what's exciting for me is that the aspiration for freedom and the aspiration for recognition remains really powerful, a powerful idea around the world and I'm very happy to continue to be part of it and to see how it continues to flourish.